Really good and quite relevant! I found this book forced me to have many stunning revelations! There is a passage speaking to the fact that people must stand for democracy and the republic not the institutions surrounding them. The institutions are put in place as supports for democracy and they can go off course so people must be willing to stand for the freedom of democracy itself. The whole book is begging people to wake from a brainwashed state and take what they are due. Brilliant. This tale is long, imprecise and very human. It was a simple pleasure to let it wash over me for 45 chapters. Twain's wit and derision lose nothing in the telling. 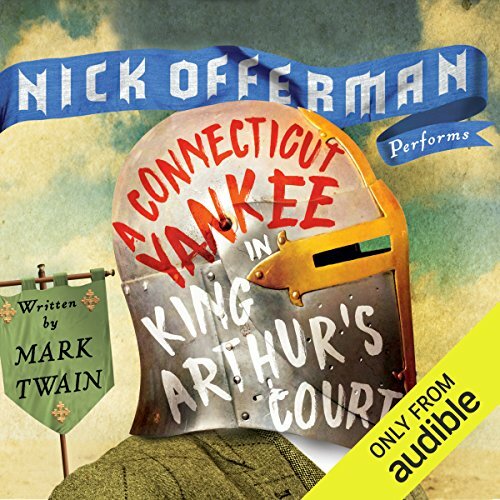 Offerman's timing and inflection are perfect, and he's a proper Yankee to boot. It is impossible to hear Offerman's narration and not picture him cast in the story as the Boss. This is good. Twain's passing lampooning of the German language is worth the price of admission.